The CPO Concerto Competition Finals: UofC vs. MRU Music Schools. 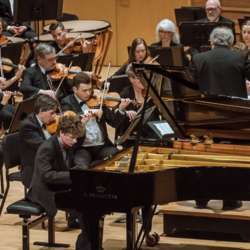 Two music students from each of the School of Creative and Performing Arts and Mount Royal University Conservatory compete as soloists in our annual Calgary Philharmonic Orchestra Concerto Competition, performed on stage with the Calgary Philharmonic Orchestra. March 5 at 8 p.m. Here is a you tube video link of Brianna Jones's (soprano) recent performance on January 11th at the semifinals where she came out as one of the two best selected out of a total of 5 musicians representing University of Calgary students. I was fortunate to enjoy that great evening of music in the company of 5 other internations members and the quality of everyone's performance was so good that the 3 judges there had a tough time to select the 2 winners. Brianna was one of the common favourites among 4 of the 5 internations attendees, who bet on her winning one of the 2 top spots and surely she had not disappointed us. Wish I had a video of the other winner , violinist Sara Far, probably still in her teens but could not find any the open web. "Violinist Sara Far began playing at the age of 3 with Keiko Takahashi, later studying with University of Calgary Professor Edmond Agopian. For 9 years she was a member of the Amici String Program, where she participated in masterclasses and chamber music from a young age. She has competed in the Calgary Performing Arts Festival every year for the past 10 years, recently placing first at the Alberta Provincial Music Festival in the Violin Senior category in Protected content . As a member of the Calgary Youth Orchestra, Sara has travelled to France and Germany to share her music with the world. An enthusiastic ensemble musician, Sara currently performs with the Mosaic String Quartet and has served as Principal Second Violin of the University of Calgary Orchestra."
. Also there was a ban on taking any pictures or video of that event by the organizers which prevented me to take any. We were very fortunate to enjoy that free admission event. i hope to see a much larger turn out from the Internations including the ones that signed up in the semifinals. Music Conservatory. Hopefully there will be details posted soon about them in the MRU website and i will update it here as soon as possible. The Protected content are Sara Far (violin), Brianna Jones (soprano), Jan Gzella (piano) and Sua Kwoun (cello).